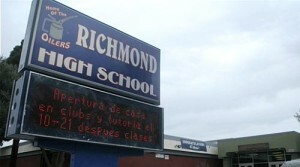 Boys from Richmond High School have been offered an opportunity to get help on a personal level while at school. The Young Men’s Empowerment Group is was created to lend support and healing for youth who’ve experienced trauma and troubles in their family and social lives. They talk about how helping the community is healing, and discuss ways to express intense feelings in a productive way. “Symptoms of trauma can really affect young men’s ability to form relationships and also with having healthy sense of self.” Read one young man’s impressions of the group on Richmond Pulse. This entry was posted on September 15, 2015 by Editor in Print, Richmond Pulse and tagged Boys and Men of Color, Mental Health, mentorship.